People who run charter businesses often find themselves away from the phone and away from their scheduling calendar. While the idea of having a website has become common in the charter industry, there are still a large number of companies that do not include online scheduling software on their websites. If you want to grow your charter business, then you need to have online scheduling software included as one of your online services. When a charter owner is out on his fishing boat or flying customers in his plane from one location to another, he does not have time to answer the phone and take down charter information. Many charter businesses run on a tight budget and find it difficult to hire office help. An online scheduling program will eliminate the problems that come up when it comes to running a charter business. Your clients will be able to look over your calendar and schedule their own charter and you do not have to stop what you are doing to write down scheduling information. A charter business owner utilizes as many tools as he can get his hands on to help him run his business. An online scheduling tool becomes like that administrative assistant that a charter business owner needs but could not normally afford to have. The online scheduling tool can be where you send clients who are curious about your availability, want to see your hours of operation and want to schedule a charter in the future. It can be the best administrative tool your company ever had. When a charter company uses an online scheduling tool, it becomes easier to see the growth of the company and the need for adding more charters. As your company becomes more successful, you will see your schedule fill up further out in advance. You will also start getting emails from people who want to use your business at a time when your online scheduling software says you are booked. As your business grows, your online scheduling software will let you know. If you own a charter business of any kind, then you need online scheduling software to help you run your business. 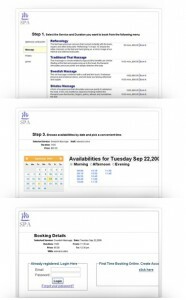 It will turn your website into an administrative assistant that does not take vacations. Your online scheduling software can also be your ticket to growing your business in a way that is comfortable for you. Learn how to grow your business with online scheduling programs at http://www.timepicks.com.